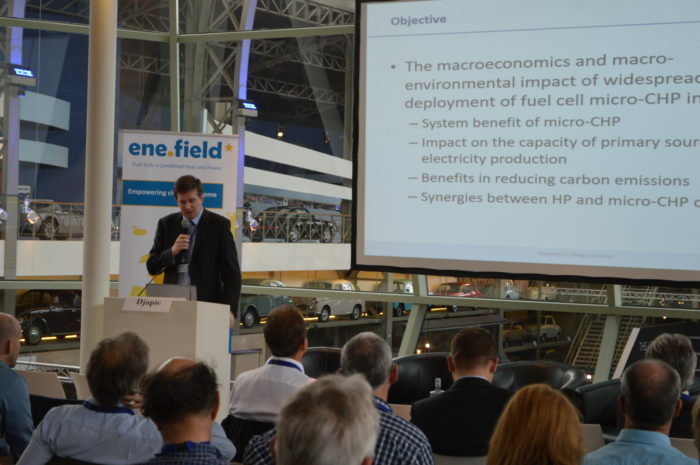 This ene.field report, authored by the project partner Imperial College London, provides a definitive result on the overall macro-economic and macro-environmental implication of a widespread rollout of fuel cell micro-CHP technology for Europe’s electricity systems. The use of micro-CHP systems is appealing due to two fundamental reasons: (i) the efficiency of energy conversion is above 90%, much higher than the efficiency of Combined-Cycle Gas Turbine (i.e. around 60%), (ii) the systems are installed at the end-use premises reducing the need for energy transport infrastructure and losses. The micro-CHP can also provide a local peaking capacity (back-up), and it can become an alternative to the conventional boiler in a smart home environment where the electricity and heat demand can be managed more efficiency. The study involves analyses on the impact of micro-CHP on the capacity and operation of the electricity systems across Europe and the impact on CO2, gas consumption across different uptake scenarios and system backgrounds.